Dell PowerEdge blades address data center server sprawl and complexity by delivering one of the most energy efficient, flexible and manageable blade servers on the market. Dell PowerEdge M600 offers outstanding virtualization performance in a 2-socket blade server combined with optional, factory-integrated virtualization capabilities. Dell continues to simplify virtualization by streamlining virtualization deployment and providing ease of use in virtual infrastructures. By factory integrating VMware® ESXi 3.5, customers receive VMware capabilities and migration of virtual machines within a few clicks of a mouse. Designed for energy efficiency and density, blade servers address the growing power and space constraints of your data center. The M600 blade server is one of the most energy-efficient blade products on the market, and has a 60 percent greater density than traditional 1U servers — energy efficiency and density that can’t be beat. With blade servers, expanding your data center has never been easier. Once you have installed a blade enclosure, adding an additional server is as simple as sliding in a new blade and powering it up. Coupled with the Altiris® Deployment Solution for Dell servers and the Dell OpenManage™ Systems Management tools, Dell blades are one of the easiest to deploy and manage in the industry. The M600 blade server is paired with the M1000e modular blade enclosure for an optimized blade solution. The M1000e is designed from the ground up to combat IT complexity so that it can deliver unbeatable levels of energy efficiency and flexibility. Designed to support future generations of Dell blade servers and technologies, your M1000e investment is protected for the future. Only Dell M-Series provides complete, snap-in FlexIO scalability down to the switch interconnects. FlexIO technology is the foundation of the M1000e I/O (input/output) subsystem and delivers the flexibility to design the solution to meet your requirements today, and the scalability to add or change options as warranted by your data center or future technologies in the future. The M-Series enclosure supports a broad set of modular Ethernet blade switches including PowerConnect and Cisco Catalyst. Dell’s fully modular PowerConnect switches provide great flexibility with choices in models from 1 Gb to 10GbE speeds, flexible modular uplinks of varying media types and many other valuable features. The PowerConnect portfolio, including the M6220 and M8024, offers a selection of switches for a variety of needs. Spanning entry-level GbE to GbE with stacking and 10GbE uplinks — Cisco models include the Catalyst 3032, 3130G and 3130X. The 3130 switches feature Cisco’s virtual blade switch functionality, enabling customers to interconnect up to nine switches to create a single logical switch, thereby simplifying the manageability of their data center. Brocade 8 Gb Fibre Channel switches provide powerful connectivity to FC storage area networks (SANs), such as those offered by Dell/EMC. M5424 models include both a 12-port and 24-port configuration. 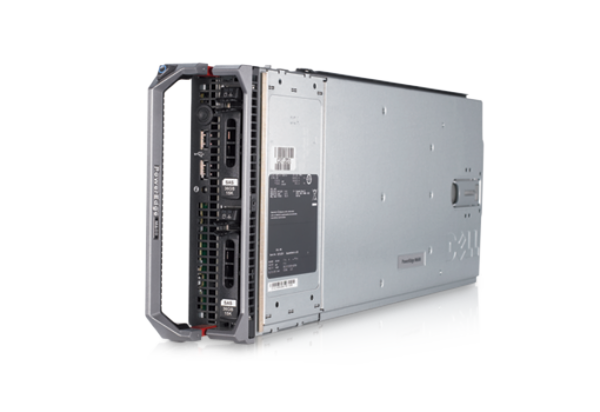 For heterogeneous integration into any FC network, these Brocade FC Switches can be configured as in Access Gateway mode. Based on NPIV (N_Port ID Virtualization) functionality, Access Gateway mode delivers the cable aggregation benefits and cost savings offered by Dell’s M-Series blade solution. For high-performance computing (HPC) or other environments requiring the highest bandwidth and lowest latency available, the M-Series offers two levels of InfiniBand (IB) switches. The industry’s first chassis-integrated Quad Data Rate IB switch is available in the Mellanox® M3601Q, with speeds of up to 40 Gbps. For Dual Data Rate (DDR) InfiniBand infrastructures, the M-Series can be equipped with Cisco M7000E or Mellanox M2401G switches. Each switch features 16 ports in and eight ports out to ensure the availability and redundancy needed for the most demanding applications. Proactive Maintenance - Maximizes the availability and stability of your infrastructure proactively. The package includes a detailed system assessment and implementation of driver or firmware updates and upgrades for your server or storage systems. Remote Advisory Options - Provides telephone and Internet access to technical expertise for specialized applications and solutions such as Microsoft Exchange, Virtualization, and more. Server Installation Services Go from factory to deployment with Dell server installation services. Our modular suite of installation services allows you to customize the right package of services needed to rapidly implement your new system. Get the skills you need to keep pace in today's competitive IT environment with comprehensive training and certification courses. Dell offers a vast array of instructor-led classes and online training courses in a range of topics from server maintenance to in-depth technical overview of specific systems. Dell offers storage technology that can enable you to derive maximum value from your information infrastructure. No other company knows more about storing and protecting information on Dell servers and storage arrays than Dell. Direct feedback from customers drives the design and development of a broad range of storage products for organizations of all sizes. What if you could manage your physical infrastructure from your virtual console? What if you could rapidly and consistently provision hardware and deploy virtual machines from within VMware vCenter? What if you could reduce the number of steps needed to deploy virtual infrastructure? And, to give you even more power, we deliver our plug-in as a virtual appliance. That makes it easier to deploy and configure and offers integration directly into the vCenter console, providing more information inside of vCenter itself — unlike many other vendors who provide only "link-and-launch" capabilities to point to their own proprietary consoles. The combination of the Dell Management Plug-In for VMware vCenter and the revolutionary embedded management features offered by Integrated Dell Remote Access Controller (iDRAC) with Lifecycle Controller in Dell PowerEdge servers gives you an unmatched level of integration between vCenter and your server hardware.